Children (preK – 6th grade) are encouraged to attend Sunday School. Classes meet at 10:00 a.m. in the Sunday School Building and in the Church Office. During class, the children watch an animated Bible story video, talk about the story, and do a creative activity. Sunday School takes place from September to June. Nursery care is provided during the church services. Confirmation, also known as the Affirmation of Baptism, is the time when a young adult publically affirms his or her embracing of the Christian faith as their own. 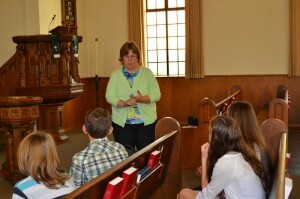 Confirmation is generally for students in the 6th and 7th grades and meets from 2-4 pm in the Fireside Room. Confirmation is a two-year program at Bethania with Year One covering the highlights of the Old and New Testaments, and Year Two reviewing the basics of the Christian (the Lord’s Prayer, the Creed, the 10 Commandments, the Sacraments of Baptism and Holy Communion) using Martin Luther’s Small Catechism. The classes are designed to be interactive, enjoyable, and a time for the young adult to safely ask any questions they may have. We blend in the importance of social ministry and the beginnings of responsible participation in church ministry. See the current issue of Bethania’s newsletter, The Beacon, for up-to-date activities for youth.